It's Day 2 of teaser time for Clearly Besotted Stamps' March release. 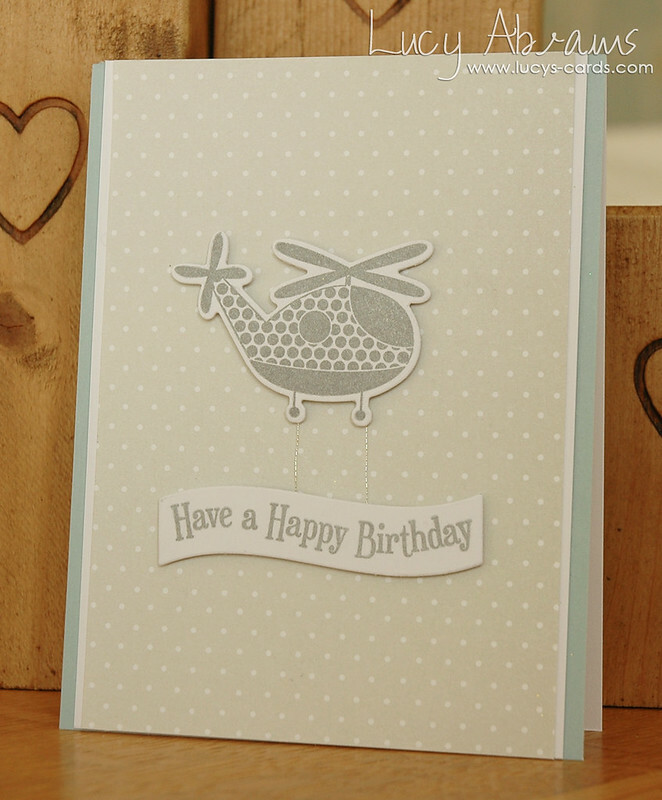 And today I am featuring the cute Take Flight stamp set and dies. 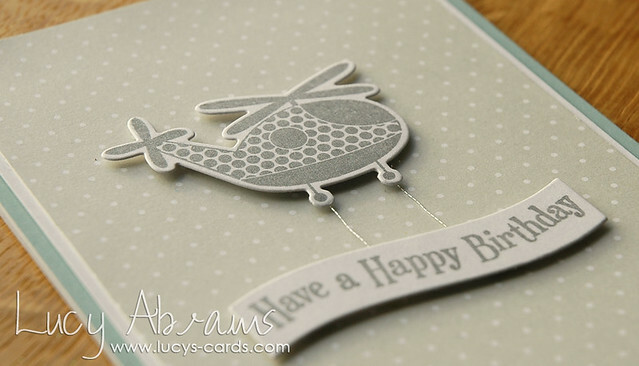 For my super simple CAS card, I stamped the helicopter and sentiment in Hero Arts Silver Shadow Ink then die cut and adhered onto some Papertrey Ink polka dot paper. This Silver Shadow Ink is so pretty and looks fabulous stamped on coloured cardstock too. I also used some Gutermann silver metallic thread to attach the helicopter and banner together. I'll be back tomorrow with my day three card. See you then. Lovely card lucy love the way you attached to banner to the little helicopter and that ink looks great. Oh this is so adorable and sweet! A-DOR-A-BLE! The wee helicopter carrying the banner is simply wayyyyy too cute! Love this! Found you just a week ago and spent ages on your blog. Clever of Stephanie to sign you up! Lovely cards. WOW-you are on a roll. So many great cards in a row! I love the monochrome palette. This little helicopter is so much fun. This card is SO cute and perfect for either boy or girl. I love the HA ink. Had not seen it before. Gorgeous card! That banner attached to the helicopter is brilliant. I love the silver shadow ink, haven't seen it being used before. Thank you for sharing.